Born on 16th September 1980 in Pietermaritzburg, South Africa. A strongly built defender, who impressed Tottenham on their two match tour of South Africa in July 2003, Orlando Pirates' Mbulelo Mabizela was brought back on the plane with them to England, where he trained and further shone in matches against Luton Town and Sporting Lisbon. The tough tackling defender won over the fans in the Lisbon match and his calmness on the ball, allied with good distribution meant that most thought Tottenham should sign him up for about £1 million. Which is what the club did in August 2003, after getting a work permit on appeal. Called up for his South Africa debut in 10th November 2001 against Egypt, he became the country's youngest ever football captain aged 21 (v Trinidad and Tobago on 14th June 2003) and had played over 40 times for South Africa (October 2005) and has scoring twice. The 22 year old shows all the strengths that Spurs had been lacking in a defender. An imposing presence, a willingness to get stuck in and someone who is good in the air. Hopefully, he will not suffer the injury jinx that most of the Spurs team fall victim to these days. He has expressed problems with his team-mates not helping him settle in, but this was dismissed as a loss on meaning in interpretation to a South African newspaper. 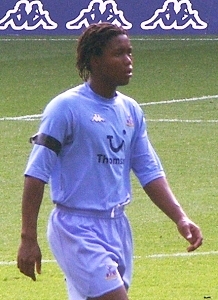 His presence in the first team was not immediately forthcoming, Mbelulo made his debut for Tottenham against Leicester City at the Walkers Stadium on 19th October 2003 and hit the winning goal - a thirty yard pile-driver. He failed to find a regular place in the team and when new Head Coach Jacques Santini came in, he was not considered for the first team. Having played seven matches and scored one goal and playing a couple of games under the new management of Jacques Santini, the club released him in November 2004 after he failed to establish himself in the first team. Rumours of him arriving drunk for training were heard, but there was no evidence of this, but he had gone missing from a South Africa training camp a few months before and the captaincy of the team was stripped from him. On leaving Spurs, he had a short trial with Fulham, but joined Norwegian side Valerenga, but in August 2006, Mabizela left Norway to return home to play for Mamelodi Sundowns, where he was the subject of a positive drugs test, which earned him a lengthy suspension from playing. Following some disciplinary problems, he left the Sundowns and was offered a contract with the Platinum Stars, but a drink-drive charge was brought against Mbulelo, although this was later withdrawn as his rights had not been properly explained to him. He was re-offered terms with the Platinum Stars, who had threatened to terminate his deal owing to continued ill-discipline and he played with them, turning out against England in a pre-World Cup friendly in 2010. In 2011, released Mabizela, who then joined Wits Bidvest, but became unsettled and moved on a free transfer in January 2013 to sign for Chippa United. The team were relegated and he was once more freed, joining Mpumalanga Black Aces for the rest of the 2013-14 season. In December 2014, he was released after a disagreement with the coach and in January 2015, the defender was signed by AmaZulu. Orlando Pirates (South Africa) 2001 ?? ?? ?? ?? Valerenga (Norway) 2005 ?? ?? ?? ?? Mamelodi Sundowns (South Africa) 2006 ?? ?? ?? ?? Platinum Stars (South Africa) 2009 ?? ?? ?? ?? Wits Bidvest (South Africa) August 2011 Free ?? ?? ?? Chippa United (South Africa) 20th January 2013 ?? ?? ?? ?? Mpumalanga Black Aces (South Africa) October 2013 ?? ?? ?? ?? AmaZulu (South Africa) January 2015 ?? ?? ?? ?? - (South Africa) 2009 ?? ?? ?? ?? "I had a good start at Spurs, but it was too short and that's something I will always look back on with regret. I've made a lot of mistakes in my personal life, things I'd rather not elaborate upon, and that was the reason I had to leave Spurs. When I came back to South Africa, I went for help, I got help and I'm still being helped. I wouldn't say I'm okay, but I feel I'm going forward. Platinum Stars have really helped me and at the moment, I feel that I've really moved on. I am ready to move on with my career, even possibly back to Europe and I'd like to play for the Bafana Bafana international team again." "It is very special – getting my first game and scoring my first goal. I have never scored such a goal before. When I saw it coming to me, I thought “here is my opportunity”, I just pinged it into the net. I don't know what I was thinking about when it went in, it was just a great moment and, of course, I went straight over to the fans to celebrate with them."